You are here: Home 2011 October Guess: What Are the Main Top Tech Trends in the Near Future? 2011 is approaching end, and 2012 is coming. What’s the most impressive thing for you? How do you think about your 2011? Well, So many things we can talk about, so many experiences we can share. With the fast development of Information Technology, technology industry has more and more potential. What do you think of the main top tech trends in the near future? Let’s guess. 1. Mobile devices push the wireless networks to the breaking point — As more people get smartphones, the data traffic on the networks will produce lots of headaches for users and operators alike. Other gadgets will also tap mobile networks, from eBook readers to connected cars. The arrival of 4G networks using LTE technology will help alleviate the growing bottleneck problem, but wireless operators will have to turn to Wi-Fi networks to offload data traffic so they can support the increasing volume of telecommunications traffic. You can expect a lot of innovation to focus on making the most efficient use of the available spectrum. The government may set aside more spectrum for wireless services, but don’t expect that to happen soon. 2. Quality wins — When it comes to digital entertainment, quality wins. That’s the way it has always been in the content business. The next Harry Potter movie coming in 2011 will be a blockbuster, because it’s based on a great story. The Call of Duty video game coming in the fall of 2011 will hold gamers spellbound. While these reliable entertainment properties aren’t original anymore, consumers embrace them because they know that the brands have come to mean a rollicking good time. Whenever a company wants a new technology to take off, it can’t forget about the quality of the content that it will enable, especially for those big and famous companies (Apple, Google, Microsoft, Cisco, etc.) who won consumers by its technology, service, innovation, quality, etc… If you want to launch a great game console, you have to make great games. This makes plenty of sense, but it’s easy to forget about the quality of content when there are so many other things to worry about, like technology, distribution, business models, and marketing. Netflix may be riding high now, but it won’t last if it can’t get access to the best movies. The Xbox 360 is doing great, but where will its big hits come from if Microsoft allows the best developers — such as Halo creator Bungie — to leave the fold? Another implication of quality is that it will not only help with acquiring new users, it will also help retain them. In 2011 and in the future, this trend will rule as consumers sniff out the good stuff. 3. Shopping gets more fun as e-commerce is reinvented — The first generation of e-commerce sites were all about functionality. Amazon.com and eBay made it easy to start buying and selling things online. But now is the time for shopping to get fun, according to Jeremy Liew, a managing director at Lightspeed Venture Partners. That’s where social shopping comes in. Groupon’s popularity and its big market value (it turned down a $6 billion offer from Google) show that electronic commerce isn’t a moribund market. We just saw a record-setting holiday online shopping season where consumers spent $30.8 billion in the U.S. But that’s nothing compared to what could happen as more innovations hit the market and makes shopping more fun. From gamification to changes in user interfaces, there is still plenty of innovation that could happen in the e-commerce market to transform online shopping into a more interesting and addictive experience. What’s more and more important, many manufacturers took part in the E-commerce to better understand its clients and potential consumers. Also shopping online will be main trends for certain people with the development of E-commerce. So, what commodities you prefer buying from online to purchasing from shop? 4. Cars drive themselves — For those of you who always wanted a car like David Hasselhoff’s smart car, KITT, from 80s TV show Knight Rider, your dream may be getting close to coming true. Google has already tested a driver-less car that is driven completely by a computer. More players will likely enter this fray as the technology gets better. Eric Schmidt, chief executive of Google, correctly observed that the worst problem with driving cars is human error. Computers don’t send text messages while driving, nor do they drive under the influence or get distracted while listening to the radio. Computers can use radars to sense traffic ahead of them and react faster than a human can when it comes time to slam on the brakes. Humans may be afraid to trust their computers to drive, but it can’t get much worse. More than 1.2 million lives are lost in road accidents every year. If Google doesn’t launch these cars, somebody will. 5. Tech for aging boomers takes off — Baby boomers are just starting to turn 65. Logic suggests that products designed specifically for the tastes of baby boomers will take off. This means that all sorts of technologies that cater to older or retiring consumers will have a natural market. This could mean everything from more use of large buttons on smartphones to technologies that make it easier to track the health of seniors from afar so they can reside in their own homes instead of hospitals. You can laugh it off as geriatric tech for old timers. But those who take it seriously will be laughing their way to the bank. Cloud computing goes big — Cloud computing services are likely to grow from $68.3 billion in 2010 to $148.8 billion in 2014. That means everything from OnLive’s cloud gaming service to Amazon’s EC2 web hosting service will become a lot more popular. The cloud makes it convenient to launch new businesses, ride a big growth wave, and adapt to change. Cyber warfare erupts across the web — Just as WikiLeaks promised it was just getting started with document leaks, cyber warfare is also in its infancy. The attacks on Google China and the sparring over WikiLeaks were small examples of what could happen as governments and hackers square off against each other. Cyber warfare will likely hit an even bigger scale in 2011. Wintel falls apart — As Intel moves into software and Microsoft embraces other chip makers, the marriage of Intel chips and Microsoft Windows, known as Wintel, will slowly unravel into a marriage that is no longer convenient. The partner-swapping and backstabbing will continue until the companies are in a state of warfare. Emerging markets drive tech adoption — The days are long gone when users in emerging countries embraced older technology. With growing middle classes in Brazil, Russia, India, and China — and plenty of wealth in other regions has well — the demand for tech goods will continue to expand. That trend has been driving sales in tech for some time — 80 percent of Intel’s sales are overseas now. But it will also happen with web services such as social network games. Accel and Tiger Management’s recent $30 million investment in Vostu shows that the Brazilian social game market has a lot of potential. Success in an emerging market can generate the growth that a startup needs to get to critical mass. …What we listed here may be not enough to sum up tech trends in today’s society. No matter whom you are, what you work, you can feel the transformation around you. Some people also summarized top tech trends like these items: Cloud Computing, Mobile Everything, Security Issues, End-User Control, Internet TV, Tablet Computing, Hardware Purchases, and Short Attention Span. 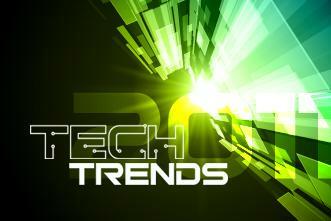 What do you think of is the top tech trend, vote it.